11 January 2015, at 12:00a.m. Advice on the proper construction of poultry houses - focusing on the foundations, roof and trusses - to withstand the elements for a long and trouble-free life from Dr Sid Thompson, Michael Czarick and Dr John Worley from the Biological and Agricultural Engineering Department at the University of Georgia Extension. 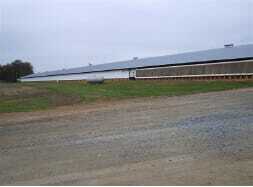 A poultry house can be considered a complex system in which all parts of the system work together to accomplish a task. Each element of the house structure (foundation, walls, knee braces, trusses, etc.) has a certain form and function that acts to support loads (e.g. wind, snow, ice) applied to the house. Poultry houses are often considered to be simple, even low-tech structures. While not complex to construct they are no less complex in how they carry loads from each part of the structure to the ground. Each part of the structure interacts with other parts. For example, a poorly built foundation can create stresses in other parts of the building (e.g. trusses), which can eventually result in failure. The loads in a structure are transmitted through the structure and eventually to the ground through the foundation. The size and type of foundation used to support a structure are based on the magnitude of the loads being transmitted to the ground as well as the properties of the soil beneath a structure. The maximum load that a foundation can carry is based on the bearing capacity of the soil. The soil beneath the structure should be well drained, have a uniform consistency and be free of organic material. Uniform, compacted soil underneath the foundation is just as important as the foundation itself. 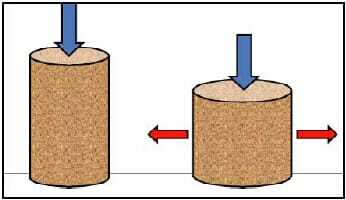 A freestanding column of soil such as the one in Figure 1 cannot stand on its own if loaded vertically. While soil can carry a load, a freestanding column of soil fails when loaded. As it fails the column will get shorter and wider. 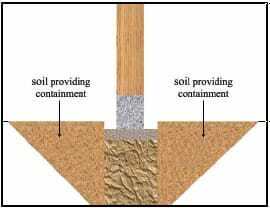 Even though the column of soil is only loaded vertically, lateral (horizontal) forces occur within the soil that make it wider. If this same column of soil is placed within a container, then the column can carry a larger vertical load. The container walls keep the soil confined within the container and help carry the lateral (horizontal) loads that occur within the soil. A building transfers loads throughout the structure to the foundation, which then transfers the load to the soil directly beneath the foundation. Like the column of soil in Figure 2, the soil directly beneath the foundation can only carry these loads if it is properly confined. The confinement in this case does not come from a container but rather from the adjacent soil (Figure 3). It is normally assumed that a triangular block of soil helps confine the soil directly beneath the foundation. The integrity of the foundation is critically important to the integrity of the structure. The foundation should not be neglected. Problems with foundations can cause problems throughout the entire structure. Though roof trusses are often the focus in the case of poultry house failures, more often than not the root cause of the failure can be tied in part or in whole to foundation issues. The minimum depth of a poultry house foundation below ground level is generally 12 inches or below the frost line, whichever is greater (Figure 4). The depth of the foundation is measured from the surface of the undisturbed ground to the bottom surface of the foundation. In the case of poultry houses with concrete 'stem walls', the stem wall is the foundation and therefore the bottom of the wall should extend a minimum of 12 inches below the soil surface. In post houses the posts themselves act as the foundation. It is generally recommended that posts be buried a minimum of 36 inches in firm soil. Posts carry loads to the soil differently than concrete foundations, hence the reason for the increased depth in the ground. Wood framing members below grade must be of approved naturally durable or preservative treated wood that is resistant to both decay and termites. It is preferred that the bottom end of the post be embedded in concrete. Foundations that are near or above grade can be easily undermined by erosion, rodents or even birds. 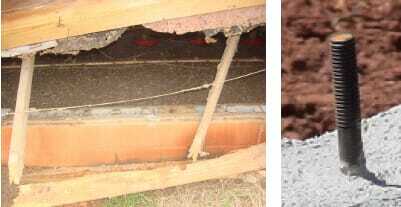 Once a foundation is undermined the structural integrity of the poultry house is compromised (Figure 5). 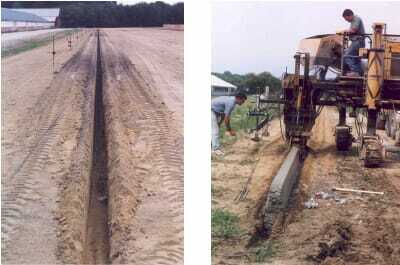 Saturated soil has little strength to support a poultry house foundation in either the vertical or horizontal directions, thus allowing movement. 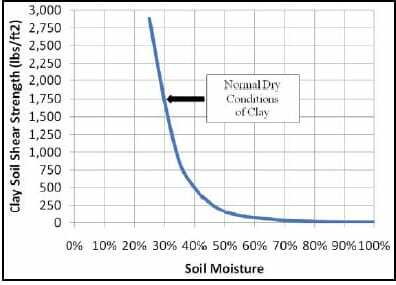 Figure 6 illustrates the shear strength (bearing capacity) of clay soil as a function of percent soil moisture. Under normal moisture conditions, clay soil is capable of supporting a load of roughly 1,800 pounds per square foot. But as clay soil moisture levels increase, the bearing capacity of the ground underneath the foundation decreases rapidly. 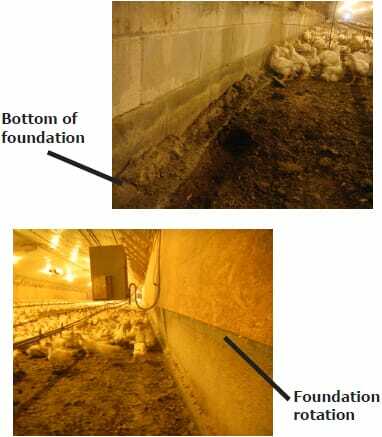 If the soil in the immediate vicinity of a poultry house is chronically saturated with water, a foundation will be more prone to settling and rotational issues that can lead to a structural failure (Figure 7). As a result, it is important that the soil around a foundation be well drained. Foundation drainage can be aided through the use of foundation drains, permeable soils or rock. The bottom portion of a poultry house foundation must remain covered with soil (Figure 8). The ground around a poultry house should slope gradually (i.e. 1/12) away from the side wall to help direct water from the roof away from the foundation. It is generally recommended that the horizontal distance from the edge of the foundation to the face of any steep slope (3/12+) be a minimum of five feet. For steep slopes, rock may be required to prevent erosion. 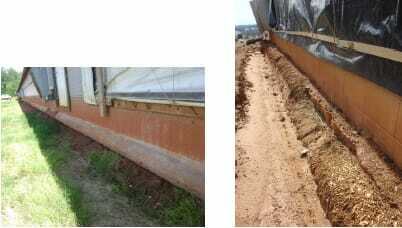 The ground in the vicinity of the foundation should be protected from scouring due to rainwater flowing off the roof of the poultry house through the use of vegetative ground cover, rocks or gutters (Figure 9). Over time, scouring can lead to the erosion of soil near the house foundation, thereby effectively reducing foundation depth or possibly undermining the foundation. When scouring has occurred it is important that proper grade is reestablished as soon as possible to prevent foundation movement. An interior foundation depth of eight to 12 inches must be maintained in order to maintain proper vertical and lateral support. Differences between interior and exterior grades can result in uneven loads being applied to the foundation, which can lead to foundation rotation (Figure 10). When cleaning out, the foundation must be protected from damage and undermining due to excessive soil removal. 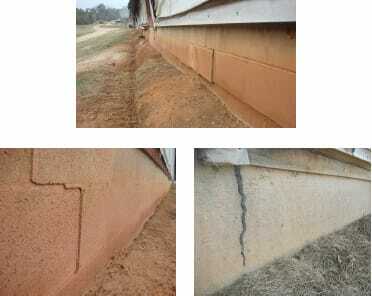 Cracking in a foundation wall is normally a sign of uneven settlement or wall rotation (Figure 11). Settlement is not an adverse characteristic of a structure, provided it is uniform or equal all around the structure and is not excessive. Unequal or differential settlement of a foundation can cause problems in the structure above and can cause it to lean, become unstable or produce large stresses and forces in the members throughout the structure. Rotation of the foundation wall is normally caused by poor soil conditions – either poor (sandy) underlying soil or poor grading around the structure (Figure 12). Remember that for a concrete stem wall some slope exists in the side of the walls even with no rotation. To determine how much that built-in slope is, measure the slope near the end wall of the house or at a point where no rotation has taken place, then compare it to the slope at the rotated section. For block walls the above-recommended rotation should be reduced if vertical steel was not placed in the wall between courses (Figure 13). Without vertical steel the rotation of the structure is carried only by the mortar joint between block courses (Figure 14). High winds moving over a poultry house roof can create powerful lifting forces that can pull the roof from the side walls or the side walls from the foundation. 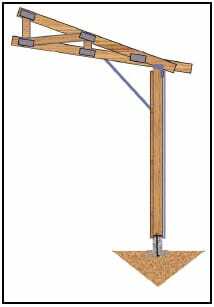 The lifting force on a poultry house is exponentially related to wind speed (Figure 15). That is, a doubling in wind speed can increase the lifting force four-fold. 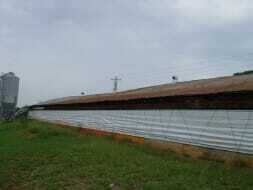 For most areas of Georgia, poultry houses are supposed to be built to withstand a 90 to 100mph wind without failure. For coastal areas the design wind speed is approximately 120mph. 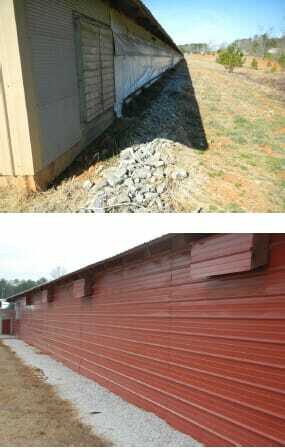 In order to maintain the structural integrity of a poultry house in high winds it is important that the foundation and side wall act as a single structural unit. Post houses are a prime example of a single structural unit because the post is continuous from the foundation to the eave of the house and acts both as the side wall and the foundation. In the case of houses with concrete blocks, the foundation must be positively connected to the blocks, which in turn must be positively connected to the remainder of the side wall. In houses with concrete stem walls, the concrete stem wall must be firmly attached to the wooden portion of the wall. In concrete block wall houses, the sill plate should be periodically connected to the foundation through the use of anchor bolts or straps (Figure 16). The anchor bolts or straps must be placed not less than four inches and not more than 12 inches from the end of each member making up the sill plate. In concrete stem wall houses, the stem wall is essentially the foundation and as a result the sill plate should be connected to the stem wall through the use of 'J bolts' positioned every eight to 10 feet. Where wall framing is not continuous from the foundation sill to the roof, members should be tied together to ensure a continuous load path. The vertical members (i.e. 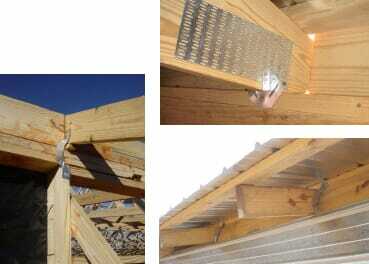 sill plate, wall studs, truss plate) in the wall must be positively connected together through the use of lumber, straps or clips. It is important to realise that nails loaded in withdrawal (driven into the end of the studs through the bottom plate) are not sufficient to provide this positive connection in high wind conditions (Figure 17). Figure 18 illustrates an example of a side wall where there is a continuous load path. The sill, block wall and foundation are tied together through the use of a J-bolt and a filled concrete block core. The studs are connected to the sill by the exterior sheet metal and the interior plywood. The truss and the truss plate are tied to the side wall through the use of a “hurricane strap”, thus forming a continuous load path from the truss to the foundation. Figure 19 shows a curtain-sided house where the bottom curtain board/exterior side wall metal is nailed to both the sill plate and the side wall members, thus tying together the lower portion of the side wall. Concrete block walls can be degraded by the ammonia in litter. Litter has a higher pH than concrete and also contains salts and moisture. Continuous exposure to manure can reduce the strength of concrete. A precipitate layer forms on the block surface because of the manure, reducing the strength of the blocks and decreasing the cracking strength of the blocks (Figure 20). In some cases the blocks can be eroded by the presence of the litter against the block wall. Block wall foundations must be inspected for erosion of the block. If sufficient damage to the block wall occurs, then the block wall must be replaced or repaired. In addition to lifting forces, winds can also generate lateral forces that can push a house over. 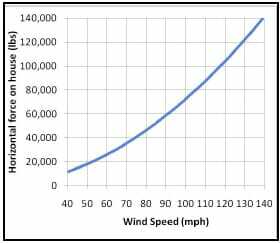 The lateral wind loads, like the lifting loads, increase exponentially with wind speed. 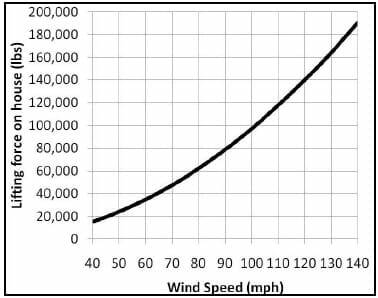 A 40-mph gust can generate 10,000 pounds of force trying to push a poultry house over (Figure 21). In a poultry house, lateral forces are transmitted down through the truss to the walls and then the foundation through the use of knee braces (Figure 22). The knee braces eliminate rotation at the truss to wall connection points and increase the ability of the wall section to carry vertical loads. The knee braces are needed to prevent excessive lateral movement. While knee braces may not be required on each truss, knee braces must extend over much of the house to carry these loads. 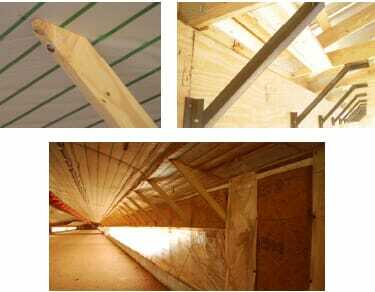 The truss wall system of a poultry house is an unstable mechanism without such bracing. Without this type of bracing, the walls of a poultry house are not built to withstand the lateral forces caused by winds. Knee braces must be of sufficient size to carry the loads from the truss to the wall. Normally this might be 2×4 members or 1.5×1.5 inches in brace and wall must be sufficient to transfer this load. It is recommended that lag bolts be used to make this connection (Figure 23). The truss must be positively connected to the wall to prevent problems during up-lift caused by wind loads. Where wall framing is not continuous from the foundation to the roof, the members must be secured to ensure a continuous load path. The truss must be positively connected to the wall by straps, clips or connectors made of corrosion-resistant material not less than 0.040 inch in thickness (18 to 20 gage; Figure 24). Nails loaded in withdrawal are not sufficient to provide this positive connection in high wind conditions. Most trusses are manufactured using steel connector plates. Many of these trusses are pre-engineered. However, most pre-engineered trusses are designed as individual member components and do not take into account the interaction between members within the structure. While these trusses are designed to carry certain loads they may not be suitably engineered to meet all of the design needs of a structure. Often, these trusses are not designed to interact with the walls of the structure that are used to carry the lateral loads caused by wind down to the foundation. The connector plates should be located on both faces of the truss. The nails should be fully embedded in the member. The members should be cut for tight-fitting wood-to-wood bearing at the joints. The trusses must be braced such that they remain in a straight and plumb position (Figure 25). Trusses must be handled with care during banding, bundling, delivery and installation to avoid damage. The roof line should be straight and horizontal inside and outside (Figure 26). 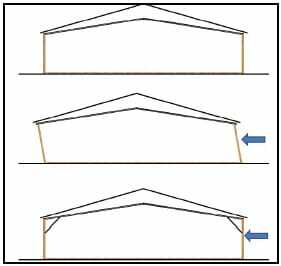 From visual inspection of the house, if the roof line is not horizontal then a detailed inspection of the trusses and house must occur in the region of the house where this settlement has occurred (Figure 27). In that region the trusses must be inspected for straightness as well as any problems associated with truss plates, twisting of members, etc. The region to be inspected must extend a sufficient distance in both directions from the point where settlement has occurred to make sure no additional problems exist. Knee braces must be added in that region of the house if they are not already provided. If, during truss inspection, truss plates are found to be pulling out of the wood, trusses should be repaired using plywood gusset plates on both sides of the truss at the joint having problems. The roof should be inspected to make sure all the roof metal is adequately attached to the purlins and that no leaks occur in the roof. 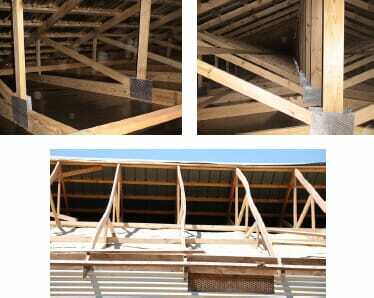 No sagging should be observed in the roof between trusses. From visual inspection of the house ceiling, all holes in the tri-ply must be repaired. Leaks in the try-ply ceiling allow moist, ammonia-laden air into the attic space, which can lead to deterioration of the trusses and other support structures. Ben Franklin once said, “An ounce of prevention is worth a pound of cure”. This timeless truth is nowhere more evident than in a structure such as a poultry house. The more a foundation rotates or settles, or the more out-of-square a roof truss system becomes, the more difficult and costly it is to correct the problem. Putting a little extra effort into proper construction and maintenance can pay large dividends in preventing large losses later. The foundation, walls and trusses and the connections between them are all critical parts of the frame, and each one affects the others. A weakness in one member can cause a failure in another. By the same token, strength in one can help overcome a weakness in another. Most failures are due to a combination of weaknesses in the structural members. Improvements in any of the factors described in this publication will help the strength of the building. The best course of action is to pay close attention to all of the critical components of the structure. When that effort has failed and problems with a building have become evident, some of the suggestions in this publication may be useful. When in doubt, contact a structural engineer to provide the expertise needed to address the problem.